"I want to sleep like a girl"
Today MAM’s new bed was assembled. She’s had a bed all along–she started on a twin sized futon floor bed, moved to a double bed mattress, then we added the box spring (but kept the whole thing directly on the floor), and today she moved to a twin bed on a frame. 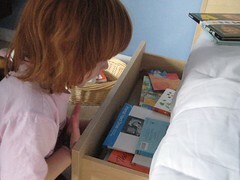 A super-cool “storage frame”, so under her bed she can store her treasures (and over her bed is a hutch). Next up on Operation Share Her Space: assemble the matching dresser. Then we’ll clear out two dressers that are in her room (reclaiming the one I donated to her cause three years ago), making room for the nursery furniture we’ll be adding at the end of June. Oooh – very exciting stuff! Love that bed! I’ll have to learn where you got it.